Glasgow Rocks have filled their quota of American signings for the upcoming season after Martez Harrison agreed a deal to join the club for the 2017-18 season. 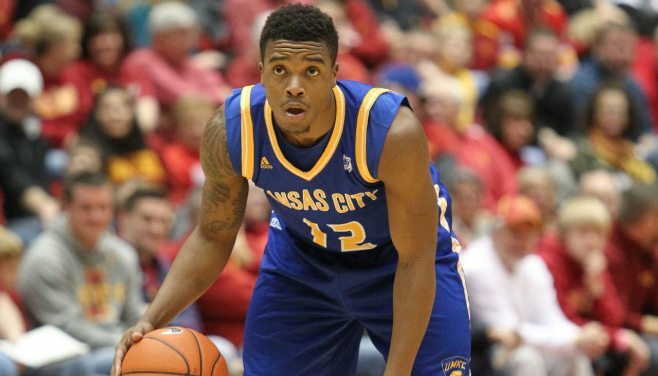 The 5ft 11 in point guard became the University of Missouri-Kansas City’s first ever All-American in its history in 2015, whilst also being crowned Western Athletic Conference men’s basketball player of the year. Harrison was named the league’s freshman of the year the season previous when he broke school records in points per game (17.2) and also contributed in many other areas, including – assists (114), steals (50) and free-throws made (164). Rocks’ Head Coach, Tony Garbelotto, has been searching for a point guard that would be the right fit for the club and he believes Harrison is the man. “Martez has had a tremendous college career and I am excited he chose to start his professional career with us,” stated the play-caller. Harrison completed his college career with an average of 16.7 points, 4 assists and 3.1 rebounds per game – not to mention that at one point during his college career, he scored double-points in 43 consecutive games. He will be taking the helm at a position which historically, has been occupied by such talented and revered players as Rob Yanders, EJ Harrison and most recently, Neil Watson. Martez understands that he has big shoes to fill, but is confident that he is the court general to take the Rocks to the next level. He said: “I want to thank the Glasgow Rocks for giving me the opportunity to start my professional career in a wonderful place and I hope that I can bring the city the success it deserves. The Glasgow Rocks BBL season officially begins on Sunday 1st October when they take on the Sheffield Sharks in front of an anticipated bumper home crowd. With more player announcements scheduled in the coming days, the Rocks roster is definitely taking shape.